When people think of beach destinations in South America, Brazil often comes to mind, with visions of sunny Ipanema, Copacabana, or any of the smaller cities that dot the country's 4,500 miles of coastline. However, with a great reputation, means more crowds, and sometimes a higher cost for travelers. If you're seeking a restful and relaxing vacation, you should consider another South American country: Columbia. The coastal city of Cartagena is just a short plane ride from Bogota and it's a great starting point for embarking on a perfect beach holiday. The 5,000 residents of this tiny island off the coast of Nicaragua belong to Colombia politically, but their culture reflects their Caribbean geography. The people primarily speak English and Creole, and you're more likely to hear reggae music than salsa here. The island's location on the world's third largest barrier reef makes it a prime destination for snorkeling and scuba diving in the crystal clear Caribbean Sea. Similar to Providencia Island, San Andres sparks slightly more fanfare due to its higher profile beaches and comparatively robust nightlife. Getting here by air is easy, inexpensive, and quick (less than 2 hours from the mainland), so this island attracts both Colombian and foreign travelers. Many of the big hotel chains operate properties on the island, and they often sell all-inclusive packages. If you prefer a cozier option, there are a wide variety of apartments to rent as well. 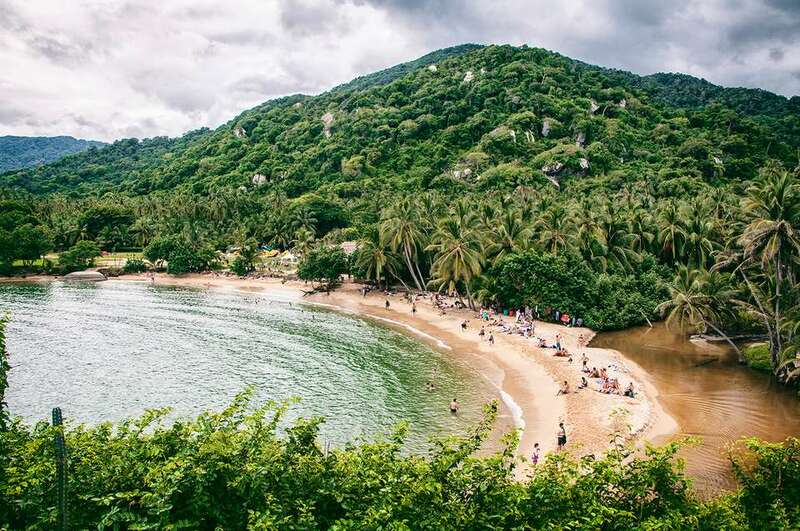 On the Caribbean coastline where the foothills of the Sierra Nevada de Santa Marta meet the sea, this national park outside Santa Marta encompasses a stunning beach helmed by a rainforest rich in biodiversity. Hiking trails connect several stretches of sand in the park, but strong riptides can make swimming dangerous. The park also contains the ruins of an ancient city of the Tayrona people. If you're up for roughing it, you can pitch a tent or rent a hammock for the night at one of the campsites in the park. Named for its startlingly white beach, Playa Blanca on Isla de Barú is a frequently thought of as the best beach in the country, though it can get crowded with day-trippers from Cartagena. The 2.2-mile stretch of powdery sand leads to stunning blue waters that provide ample snorkeling opportunities. You can take a ferry from Cartagena to reach the beach which is about a two to four-hour journey. A high-speed boat is another option that will get you there in less than an hour. Speedboats are popular with tour companies that typically plan day trips lasting about 8–12 hours and often include lunch, snorkeling gear, umbrellas, and beach chairs. Options for accommodations to spend the night include hostels, hotels, and budget-friendly hammock rentals under the palms. For a remote experience that feels like a step-back-in-time, make the trek to Capurganá near the border of Panama. Surrounded by a lush jungle, the beaches in this area attract divers, backpackers, and travelers looking to "get away from it all." The car-free village encourages visitors to completely unplug and immerse in the abundant natural beauty.